From water attractions to dining to resort activities, Crown Reef Beach Resort and Waterpark has you covered. 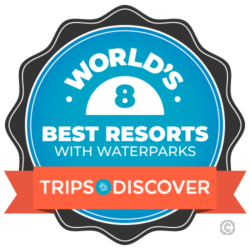 Crown Reef has been named one of the Best Hotels for Water Fun by USA Today’s 10Best and World's 8 Best Resorts With Waterparks by Trips to Discover! Guests love our 15 water features that include a giant four-story year-round waterpark featuring two giant slides and a kids' play area. Enjoy our array of outdoor pools including the longest oceanfront resort lazy river in Myrtle Beach, multiple whirlpools and two giant pools. Then, step into the shade and relax at our indoor pool! Hungry? Check out one of our many on-site dining options including the oceanfront Loco Gecko Beach Shak, our poolside bar and our breakfast buffet. Kids love our on-site coinless arcade, featuring hours of fun at the family-centered Town Center. There is never a dull moment at Crown Reef! Check out our amenities below and start planning your Myrtle Beach vacation today! Now open, the Crown Reef Resort Waterpark towers nearly 40 feet above the ground and features a 278-foot long two-person tube waterslide, a single-person 302-foot long waterslide and an 8-foot tall, 20-foot long slide for the little ones! The TWISTER Waterslide and the world’s first hotel EXPLOSION Tube Waterslide are the newest water amenities at Crown Reef for all to enjoy! The Waterpark also includes a water fun area for all ages with a silly sub and other fun water features as well as a sun deck for relaxation! The Crown Reef Indoor Waterpark is seasonally enclosed for year round wet ‘n wild fun and is the hottest new attraction along the beach! Learn More Here! We have a variety of relaxing whirlpools at our resort to help melt away your stress. Take a dip in one of our ten year-round heated whirlpools, located throughout our spacious pool deck, both indoors and outdoors. Salty’s Splash House is located within our waterpark. Fun for the little ones, it is open year-round and is seasonally enclosed. Kids love the dump buckets, treehouse and slide as well as the silly sub. There are also lockers located adjacent to the splash area, available for rent throughout the day. Located at our oceanfront waterpark, the Explosion Tube Slide reaches 278 feet in length and is 38 feet tall. Open year-round, this ride features single and double tubes and is for riders 36 inches or taller. The Twister Body Slide is a year-round attraction at the Crown Reef waterpark. No tube needed, any guests 36 inches or taller can slide down this slide! This waterslide is 38-feet tall and 302-feet long. The 8-foot-tall kiddie slide is located at Salty’s Splash House. Perfect for children under 48-inches, the slide is open year-round and is just steps away from the silly sub and mushroom fountain. Come check it out! The Crown Reef Resort sports a number of water features that will surely wet the appetites of outdoor enthusiasts including the brand new Waterpark! We also have more than 15 water features – including a tropical island pool and heated indoor pool – as well as hot tubs and fountains strategically placed around the property. Take a dip in our 125-foot oceanfront pool, take the little ones to one of our three kiddie pools or relax in one of our 11 whirlpools and let your worries drift away. Another popular pool at Crown Reef is the large winding pool at our northern tower where you can splash around out side or swim to the covered portion to get out of the South Carolina sun. Boasting the longest oceanfront Lazy River in Myrtle Beach, our resort attracts adults and children alike who simply want to relax and float around the 575-foot winding stream. Located at the middle tower, the Lazy River winds around for ultimate relaxation for all ages to enjoy. Grab a tube and hop on in! Our Island Pool is a favorite among guests. With a tropical feel, the Island Pool is adjacent to the Indoor Pool in front of Tower 2. With depths up to 5 feet, it is perfect for kids and adults alike. The Island Pool is heated year-round for your enjoyment. Our Tower 1 Bridge Pool is a giant partially covered pool on the north end of our pool deck. Enjoy the shade under the resort or swim outside and meander under the bridge. This heated pool is open year-round and is conveniently located just steps from our Town Center where you can get a refreshing drink, ice cream cone or a tasty meal. Our seasonally enclosed indoor pool is located adjacent to the Island Pool, beneath Tower 2. Heated to approximately 82 degrees, this shaded pool is the perfect place to take a dip on a sunny day or any time during the year. It reaches a depth of 5 feet and includes a kiddy pool and hot tubs. The Town Center Dining, Entertainment and Fun Zone is now open! This exciting new amenity features Swirl Ice Cream and Sweet Shop, Loco Gecko Beach Shak Restaurant, Grab n’ Go Grill and Coffee Bar, Game On! and Winner’s Circle. The one-stop location for families on vacation, the Town Center is the home of oceanfront fun for the whole family with easy access to the pool deck and the beach. Stop on by for a quick bite to eat or plan a family night out including games, dinner and ice cream for dessert. Or, grab a coffee and head out to the beach for an early-morning walk. With all the amenities you need located right on site, you won’t even have to leave the resort if you don’t want to! Hours for the Town Center vary seasonally. Game On! is now open! Located in the Town Center Dining, Entertainment and Fun Zone, it is home to the newest and coolest games. Kids can enjoy classic and modern games while playing for tickets to redeem for prizes all while using a special video game card! Guests can enjoy a variety of games such as air hockey, Ice-Ball, Sink It, Doodle Jump, Monopoly and more! Games that normally disperse tickets instead load the points onto the game card that can be redeemed for fun prizes at the Winner’s Circle. Fun for all ages, Game On! is open daily with varying hours by season. The Winner’s Circle redemption center is located at the Game On! Arcade. Part of our oceanfront Town Center, the redemption center is ready for when you are finished playing our cashless games. Just present your card to the redemption agent to find out how many tickets you have acquired and turn them in for prizes. Or, keep your card for your next visit to Crown Reef to rack up even more points with future game play! Guests will experience Myrtle Beach dining at its finest at the Crown Reef Resort. The Town Center Dining, Entertainment and Fun Zone features Loco Gecko Beach Shak, Swirl Ice Cream and Sweet Shop plus the Grab n’ Go Grill and Coffee Bar! Additionally, Crown Reef offers a full-service breakfast at the Town Center where guests can start their day with a hearty breakfast buffet based on occupancy along with a full a la carte menu including omelets, eggs, French toast and pancakes plus fresh fruits, juices and coffee. The seasonal Pool Bar & Grill features hamburgers, hot dogs, nachos and potato chips along with ice cold drinks. Our friendly and prompt bartenders also are ready to whip up a special cocktail to help guests beat the heat. We also cater banquets, meetings and special events with customized menus created by our team of creative professionals. Now open, the brand new Loco Gecko Beach Shak Restaurant features casual beach dining with a variety of menu options including salads, pizzas and burgers. It has both indoor and outdoor oceanfront patio seating, perfect for any day of your vacation. Come on in right from the beach or stop by for lunch before heading out. Dress is casual at this beach restaurant, so come on down and enjoy some great Myrtle Beach food! Loco Gecko is open year round, and hours vary seasonally. Grab n’ Go Grill and Coffee Bar is a popular new amenity at Crown Reef! Located at the Town Center Dining, Entertainment and Fun Zone, it features light breakfast, lunch and dinner items as well as fresh-brewed coffee, both hot and iced. Stop on by for a tasty beverage before heading out to the beach and start your day right! Or, come on by for a delicious quick meal. Eat it here or take it out to the beach! This oceanfront dining outlet is also the location for our daily full breakfast, available for purchase either before you arrive or at the door. Hours for Grab n’ Go vary seasonally. The Swirl Ice Cream and Sweet Shop is a fun new amenity for guests to enjoy! Located at the Town Center Dining, Entertainment and Fun Zone, the new shop features a variety of ice cream flavors and toppings as well as candy for your sweet tooth. Stop on by after a hot day at the beach or relax inside and soak up the cool air. A perfect relief from the summer sun, the Swirl Ice Cream and Sweet Shop has all you need! Hours for Swirl vary seasonally. The seasonal Pool Bar & Grill at Crown Reef Resort features ice cold drinks and grill items such as hamburgers and hot dogs. Enjoy a day at the pool and step on over to the grill where your food will be made-to-order or grab a seat at the Pool Bar and enjoy a margarita on the rocks. The Pool Bar also serves up kid-friendly items like smoothies and sodas. Families can enjoy the Pool Bar and Grill while listening to sounds of the waves crashing ashore, just steps away. Crown Reef Resort is the place for fun in the sun all summer long! With seasonal summer activities for children and adults alike, Crown Reef Resort is fun for the entire family. The Crown Reef pool deck is the place to be. From seasonal appearances by Salty, the friendliest shark mascot from the sea, to dance parties with a DJ on a summer afternoon, your family will have a memorable and fun experience at Crown Reef Resort. Kids will also love meeting Captain Sneaky and Tiki Bird as they stop by for photo opportunities with the guests on select summer dates. In addition, fun daily activities are held for children throughout the summer months such as beach volleyball, pool games, corn hole, relay races and more! Select activities meet at the Activity Room, located on the Lobby Level Room 36, while other activities take place on the pool deck or beach. *Fees may apply for select activities. With miles of pristine beaches right outside the doors of the Crown Reef Resort, visitors to the beachfront resort in Myrtle Beach will have unrestricted access to the beautiful blue waters of the Atlantic Ocean. Adults can soak up the sun on the warm golden sands as children build castles and enjoy the refreshing sea breeze. Throughout the summer the local lifeguard company rents out chairs and umbrellas – or you can bring your own! Grab your towel and head on out for a fun day in the sun. The Crown Reef Beach Resort and Waterpark sun deck spans over two levels on the south end of the resort, right by the fun and exciting waterpark. Head to the upper Salty’s Sun Deck to get away from it all and take a seat at one of the tables for some time in the sun. Or, head to the lower Breeze’s Deck and enjoy the view. Special events can also be booked on the Sun Deck, featuring 2,068 square feet of space where up to 150 guests can be hosted in reception style at this oceanfront outdoor space. The Sun Deck is located on Level 1 and Lobby Level in Tower 3. The new state-of-the-art fitness center at Crown Reef Beach Resort and Waterpark is located on the Lobby Level of the resort and is free for guests to use. At 1,144 square feet, the air conditioned center features four flat-screen televisions, two stationary cycles, two elliptical cross-trainers, two treadmills, free-weight dumbbells ranging from 5 to 50 pounds, adjustable pulley station, leg press, balance trainer and so much more. Featuring more than a dozen machines, this fitness room is a great place to stick to your workout routine while on vacation. The fitness center is located in Tower 2 and is open from 6:30 a.m. to 10:30 p.m. (hours subject to change). Salty’s Reef is the ultimate one-stop shop for your beach needs. Located on the Lobby Level adjacent to Guest Services, this gift shop features an array of beach supplies including Panama Jack sunscreen, water bottles, sunglasses, sand buckets, beach toys, flip flops, hats, snacks and more! No need to make an extra trip to the store to get your supplies—just head on up to the Lobby Level and get what you need without ever having to leave the resort.